It's a little weird that I start my first rant on a non-movie-related topic, but please bear with me. Although I've more or less quitted gaming due to budgetary reasons, I still follow the gaming news, play some Zelda, read people's rantings, etc. 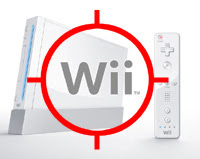 One of the big developments recently was Sony finally losing the number one mantle to Nintendo, because of one little white box everybody underestimated called Wii. Firstly, I'd like to clarify that I'm not an ardent supporter of everything Ninten... ok, ok I'm a total Nintendo whore, but it's hard not to be after being so smitten by the two epic Nintendo classics, The Legend of Zelda: Ocarina of Time, and Super Mario 64, that memories of playing those games still resonate after all these years. It's no surprise then that I was way excited over the revelation of the Wii's unique motion-sensitive controller last year. The new controller suggests a million new ways to play video games, especially first-person shooters. Instead of wrestling two short sticks (and your sanity) only to aim at something, you're finally able to just simply and instinctively point and shoot with the Wii controller. Weeks passed since the launch, and Nintendo released a slew of innovative but cutesy and family-friendly games, putting the special controller to good use. Months go by, still the same type of reflex-orientated games like Warioware and Wii Sports. If not, then it would be ports of existing games from other platforms such as The Godfather and Resident Evil 4. Yeah, there was the release of The Legend of Zelda: Twilight Princess, which was probably responsible for most of last year's huge Wii sales, but that one's really a Gamecube game and not entirely designed with the Wii in mind (although it would be mindblowing if they did). But, still nothing particularly Wii-centrically mind-blowing. Elsewhere, Sony's starting to clean up its act by showing off impressive upcoming games like Call of Duty 4, Burnout Paradise, Metal Gear Solid 4 and Little Big Planet, a puzzle-like game that ironically looks like it belongs on a Nintendo console. Meanwhile, Microsoft's Xbox 360 is aggressively vying for the top spot (and looking like they really might) with games such as Rock Band, Grand Theft Auto 4, Project Gotham Racing 4, Mass Effect, BioShock, and of course, Halo 3. But for Nintendo, apart from the next Super Mario and Metroid installments, what's the next best thing we have to look forward to? Wii Fit, a game that makes you exercise or do yoga. For real. Okay, we know your in-house games are awesome, and that I'd buy the next Zelda game on the Wii even if I'm forced to eat US-Customs-rejected toxic China-made food to save the money for it. But really, how many times do you think you could get away with just announcing the next Marios, Zeldas and Metroids every single year? No doubt Zelda's still an amazing game, but even a die-hard fan like myself is beginning to notice a slight, stale stench around the fringes. Is it really that difficult to get third party developers to come up with an awesome first-person shooter, instead of yet another generic mini-game collection or kiddie sports/platformer? I still remember how Metal Gear creator Hideo Kojima and other developers lauded the Wii's innovation in the last E3. So what happened with that then? Are the third party developers shunning the Wii like they did with the N64? Because of my recent cashless state, I have yet to "choose" my "side" in the next-gen gaming wars. But if Nintendo doesn't buck up by the time the money starts rolling in, I might just invest my money elsewhere, or start appreciating regular, not-made-in-China food. And I doubt I'll be the only Nintendo game fan feeling that way.